At home I’ve sown 18 kohlrabi, 12 fennel (despite saying I wasn’t going to this year), 25 rainbow carrots out in a tub on the balcony, 20 spinach, 18 summer PSB (this lot will not be drowned! ), 1 scallop squash to replace the one I accidentally beheaded, 4 cucamelons, 1 squash sweet dumpling. I also started chitting 22 sweetcorn, 12 are already in loo rolls and if anyone can tell me how to stop the blinkin’ things from disintegrating I’d be v grateful! I don’t have any idea what I am doing with flowers, so I hope that this is the right thing to do. I’d love some poppies too – but ones with edible seeds. Can you eat the seeds from just any kind of poppy? In my head they are in the same box as mushrooms. Don’t, unless you know exactly what it is. 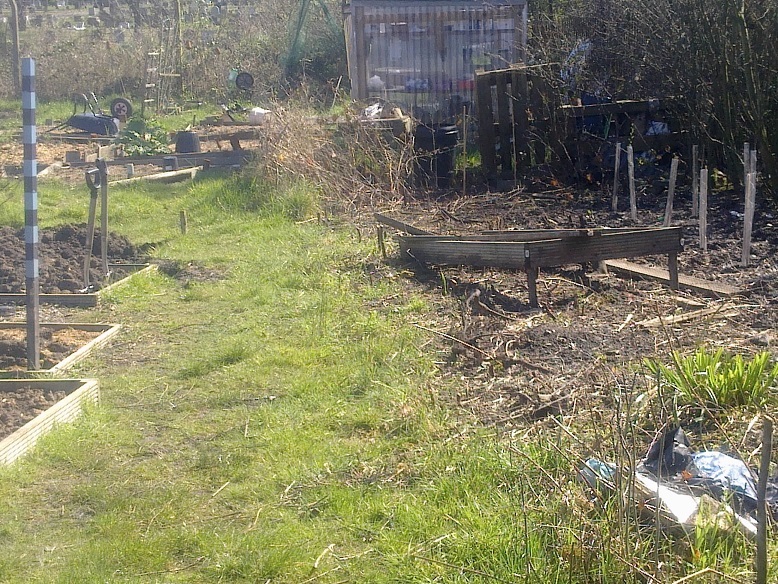 I spent most of the weekend on the plot, in the sun. I didn’t work too hard – I need plenty of time for stopping and staring and listening to birds so I’m resigned to being a slow but happy worker. The sun made the place busy – I haven’t seen so many people up at the site for some time, if ever. I’m used to having the place pretty much to myself, so this is very different! There was a lot of talk about last week’s AGM, which apparently turned into fairly aggressive argy-bargy. Glad I missed it. So at the end of the weekend, my potatoes are in, 35 in a bed and 9 in pots. This is compared to a grand total of 16 last year…and only 8 of those survived the wet. 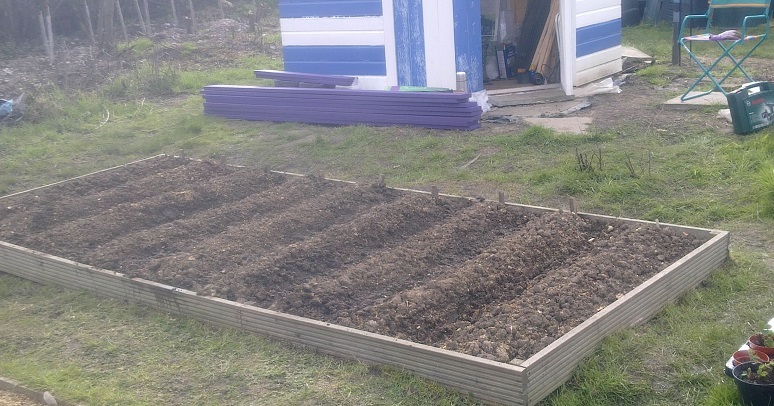 I’ve put radishes in most of the furrows, which I hope will work. And to try to fix the trench/moat I took a jug down to the plot with me and bailed out the water. I lost count after 24ish 10 litre watering can loads. Which I then tipped over the site boundary into the wasteland at the back of the cemetery. There’s more water in it today, but nowhere near as much as before. I am reconsidering having a pond in the corner. It messes up my lovely plan, but it will probably help drainage. As would having plants in the ground! The strawberry bed is getting some attention at last. It’s full of couch and bindweed, so I’m trying to rescue the strawbs and rehome them. Some had fat white grubs in the roots and I flicked those out for the birds. Am taking a chance that there aren’t loads of eggs in the plants…someone on the Forum had vine weevils, I hope I don’t. And I am very surprised at how many plants I have. I filled 42 pots, and have only got a third through the bed. I hope I can get up there in the week to finish the job. After buying more pots! 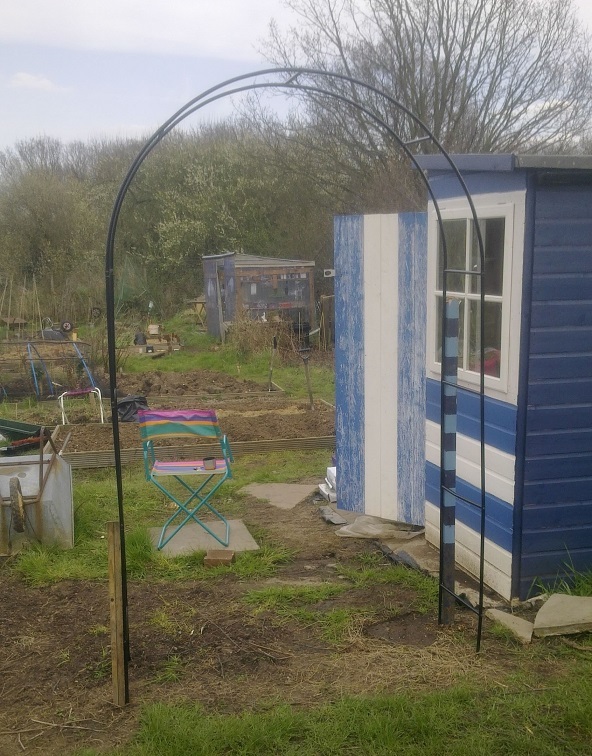 Him Indoors put up my garden arch. The arch makes a huge difference, will be even better with climbing beans and/or morning glory on it! And the Committee said yes to my having the old path as part of my plot. Yay!! That adds about 15sq.m. to my plot, all south facing and full-sun through the blackthorn, though needing regular digging as it’s near the blackthorn. I’m so pleased, I can’t wait to crack on with it, and with my plans. PS On reading Archibtbm’s diary – guttering clips for poles in the shed, brilliant idea, must get some!